Because of its versatile and timeless style, our gold curb Cuban chain bracelet and anklet can be worn by anyone, anytime, in endless ways - available for both men and women, this jewelry piece will become one of your most-loved and most-worn jewelry items in your collection. 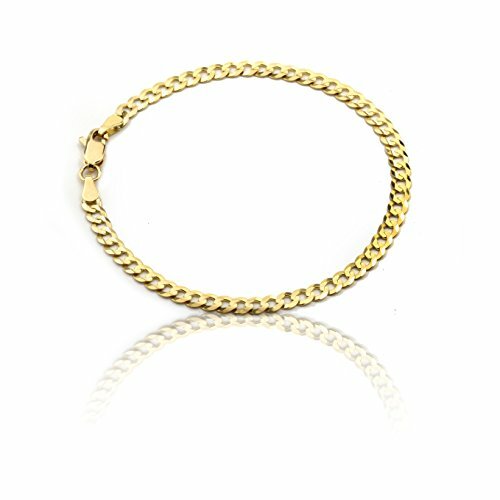 Whether you would like to wear it on an everyday basis or only for special events, the solid material of the gold chain will stay durable throughout the years, and this bracelet/anklet will stay with you for decades. What we love most about these chains is that they can be used as bracelets or ankles, for almost any occasion. While the 7-8 inch range is perfect for women as bracelets, we offer three different anklet sizes: 9 inch is for a tight anklet, 10 inch is a regular fit. For men, we recommend a 9-10 inch length, which will make an ideal bracelet. With its various material options, it is a versatile piece that can be easily customized for anyone's personal preference, whether worn with a casual outfit or with a formal look. With their endless styling options, they make an amazing gift as well. You can choose the material (fine 10k white, yellow or two-toned gold with or without a white pave design), and to ensure your loved one gets the highest quality present, we provide a gift packaging as well with each purchased item. Versatile, Simplistic Piece - Our Gold Curb Cuban Chain Bracelet and Anklet can be worn by anyone to any occasion. Sorrelli Well-Rounded Line Bracelet, 7.5"